Hari Batti's Green Light Dhaba: Hari Batti--Agony Uncle: Free advice at the Dhaba today! Hari Batti--Agony Uncle: Free advice at the Dhaba today! Since I lost my husband a decade ago, I have continued to share the family home with my husband's brother's family. What used to be one flat has been divided into two, although there is only one electrical meter and one water meter. We have always paid equal shares of all utility bills and repairs. I am not concerned about water bill as it is not very large. But the electricity bill is another matter. I use very little, especially now that my daughter is married. In fact, I spend several nights a week at my parents' home. Even so, I have to pay as much as Rs. 4000 per month during the summer, as they are running the AC day and night! There are issues around the title of the house which make it difficult to have an official meter installed. My electrician suggested we install a private meter to monitor who uses what electricity, but my brother-in-law said this would be too expensive. What should I do? First, please feel free to call me Hari! Second, I need to be clear: I am neither an electrician nor a lawyer, so you will get no reliable technical advice from me. And as far as family politics go, I'll assume you've already tried to find a reasonable and respected relative to intervene, and that for some reason that has not solved the problem. Let's see, now. I'm all for sharing. And a little bit of flexibility goes a long way in life. But you are being taken advantage of, plain and simple.Your situation reminds me of my friend who's flat mates, both of whom had AC's in their rooms, expected her to pay one third of the very large electricity bill, even though she relied on a fan only. Or of the fellow in the group who makes a habit of drinking glass after glass of imported whiskey, and then tosses down 150 rupees and slips out before the bill arrives saying, "Here's my share...sorry, I've got to be run!" Makes you want to scream. Expecting people who consume much less to subsidize people who consume much more is a bad idea when it comes to most things in life--including electricity and alcohol. Not only that, forcing you to pay half of the bill when you use much less than half the electricity violates an environmental principal that applies in most any situation, including both international and intra-family negotiations: the polluter must pay! So you know you are right, but what should you do? That's more complex. Your brother-in-law is not resisting the meter because it's too expensive; he knows it will mean he has to pay more. Your approach depends on his attitude and how hard you are willing to fight. If it were me, I would start by trying something simple. Say something like, "I do not spend much time at home, as you know, and I use the AC very little. I feel my share of the bill should be rupees 1250 per month. Do you agree to that?" If you have an old bill from a time when you stayed alone in the house (perhaps they went out of town), you could use this as the basis for coming up with a figure that reflects your actual usage. Another option is to divide the bill on a per person basis (there is only one of you, so your share should be less). This approach is straightforward, but it would not reflect the time you spend at your parents' house. In any case, the most important thing is to come up with a proposal that is simple (for the sake of your brother-in-law) and reasonably fair (for your own sake). Then propose it to your brother-in-law and his wife. Make sure you ask this question: "Do you agree to this?" This approach, by the way, worked for my friend and her AC using flatmates, who turned out to be reasonable, after all; sometimes we just need to ask for what is fair. If you do not get the desired response, then you have a choice. You can live with an unfair situation; we all have to do that at times. Or you can say, "I am disappointed. I no longer want to over-pay for electricity. I will look into having a meter installed and if it is possible, then I will have the work done. I hope you will be fair and help me pay for any necessary electrical work, but I plan to have it done, regardless." Then you must do the needful: have a meter installed, if possible, and then pay only what it says you owe. Things may be tense for a time. But you are already tense, now, aren't you? If you've got a question you need some green advice on, send it our way! We might even answer it. And for all you readers out there who like to procrastinate, it's not too late to turn in your Children's Day homework! Just write a letter to a child telling what you will do for climate change. 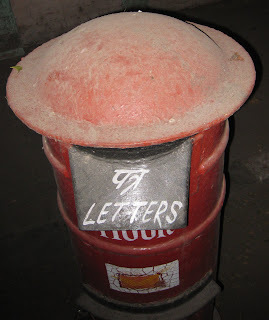 Send it to me at haribatti123@gmail.com, and I'll publish it--or put it on your blog and I'll link to it next week. Send me a picture or two and I'll make it look nice. Details at the bottom of this post. Now I'd like to believe that some of you are just being bashful, that you've already done the work, but you are too shy to turn it in for extra credit. And there will be no sore knuckles, no squatting or grabbing of ears, no tight slaps of any kind hear at the Dhaba! In fact, we won't even rely on guilt or shame--though it is tempting, I'll admit! But do consider turning in a letter, pretty please! The electricity lines run right next to the cave I live in. One night, I climbed up the pole, tapped into the line, and ran a power cable down to my home. No meter, no pesky bills in the mail every month. Every once in a while a representative of the power company will come around wanting to charge me with stealing electricity. I just slip him US$20. Everybody wins. Meanwhile, my AC is on full blast. I think this will solve Mrs. K's problem. HA! I didn't know that was an option in the USA! Wow, you learn something new every day. Hmm lets see...yahoo rates says the dollar buys about 46 rupees today. That mean the power employee eats roughly 920 INR...hmm, you might be on to something, but as for the ethics of it...I guess crime fighters typically get some exemption regarding ethical questions.